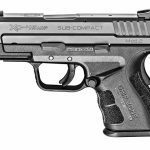 Springfield's new New XD semi-autos, available in 9mm, .40 S&W and .45 ACP, are ideal for defensive carry. 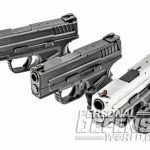 Springfield’s new XD Mod.2 pistols in (from left to right) 9mm, .40 S&W and .45 ACP, were designed for enhanced handling and control. XD Mod.2 pistols feature red fiber-optic front sights like those on the ultra-compact XD-S for faster target acquisitions. Like previous XD models, Mod.2 pistols use tapered barrels with full-length guide rods and dual recoil spring assemblies. 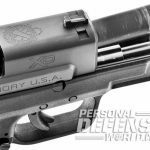 Springfield Armory has a reputation for innovation, something that is hard to achieve when you begin by building a copy of a gun that has been in production for over 100 years. 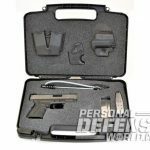 Still, the team at Springfield managed to not only perfect the Model 1911, but also make the design their own with a seemingly endless array of improvements and model variations over the last 30 years. 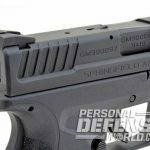 In 2001, Springfield took the next step by creating a gun of its own (with the help of Croatian arms-maker HS Produkt) that has evolved over the past 14 years into one of the most successful semi-auto handgun lines in the world, the Springfield XD series. 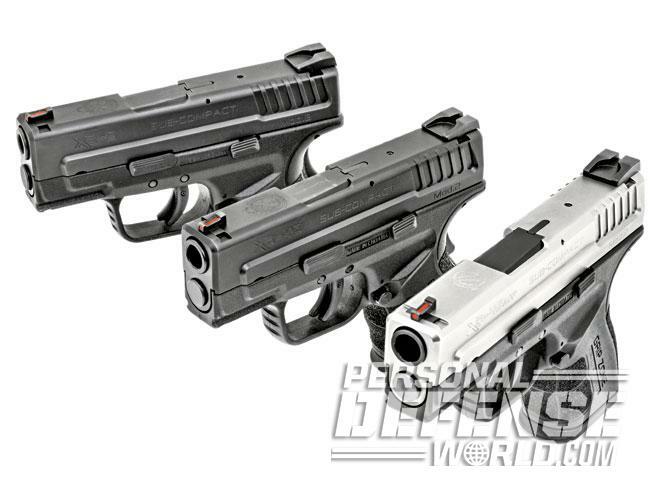 In 2015, the arms-maker added not one but three new upgraded XD models in 9mm, .40 S&W and .45 ACP. 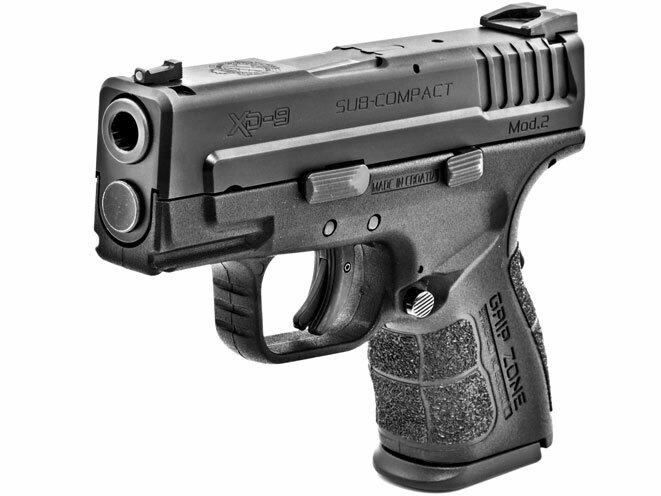 Since the XD series was first introduced, Springfield Armory has made continual improvements in the design of the polymer frames, slides and internal mechanisms, with each succeeding model showing a marked step forward either in function, capacity or size, which now ranges from the original full-sized XD Tactical to the latest subcompact XD-S series. 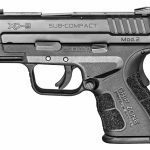 What you have with the new XD Mod.2 line is a design combining the 3-inch barrel length of the XD Sub-Compact (introduced in 2003) with improvements developed for the XD-S models (namely, a red fiber-optic front sight and a white-dot rear sight), a new frame-to-slide contour and interface and Springfield’s innovative new Grip Zone to improve a shooter’s control. Appropriately named, the XD Mod.2 is a significant departure from the shape of the first-generation XD in how the frame and slide contours integrate externally. 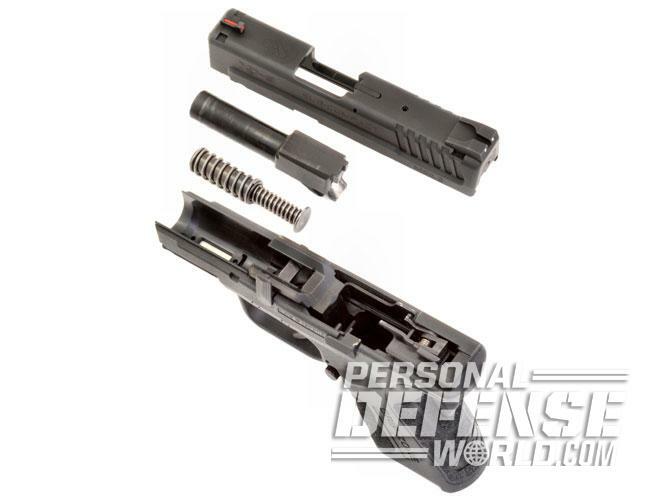 Polymer frames and steel slides generally present two different surfaces that gun-makers simply work with, the frame and slide generally having as little difference in lines as possible (think Glock). 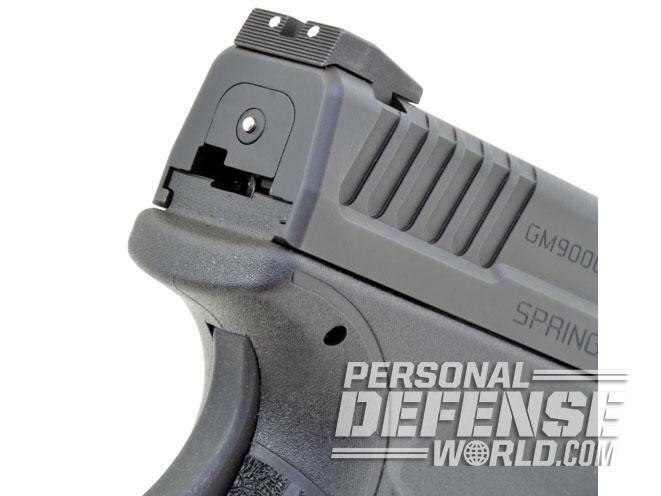 Springfield was looking for an aesthetic approach, a more unified appearance with slightly leaner dimensions to improve concealment and ease of holstering. What Springfield arrived at was what automotive designers call a “beltline,” the division between the upper and lower portion of the body. With the Mod.2, the beltline is a continuous curve that goes from the slide into the frame, creating a contiguous look. 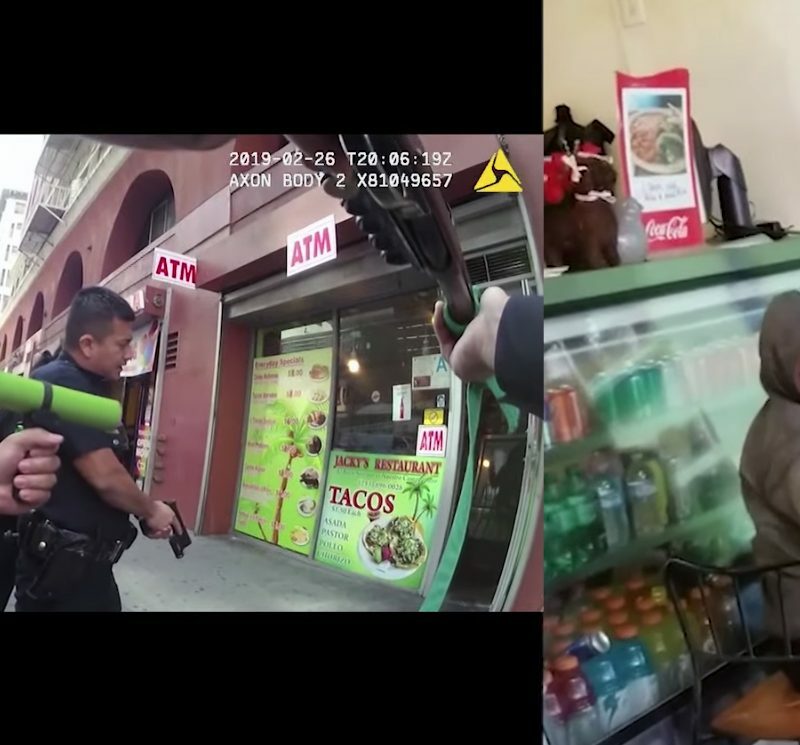 The beveled edge of that curve also eliminates the possibility of the edge catching when reholstering. 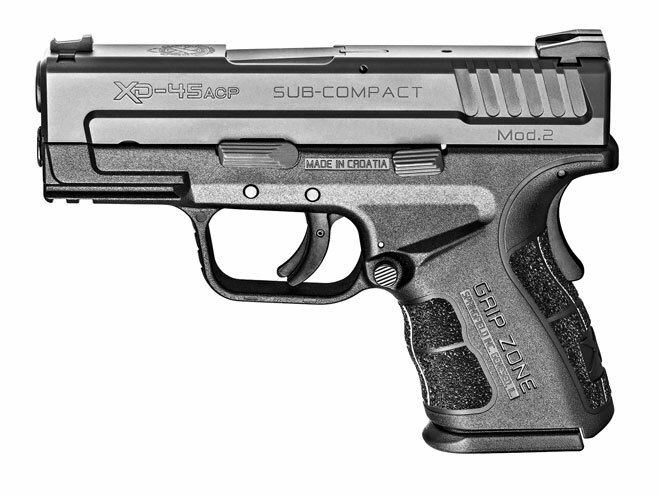 The most significant feature of the Mod.2, however, is the new grip design, which is known as the Grip Zone. The overall texturing is less aggressive than many rough textures in use today, and rather than having surfaces that can imbed themselves into the shooting hand, the Grip Zone has multiple textured surfaces that complement the dynamics of the human hand. There are three interrelating surfaces: the three-quarter panel where the palm and first joint of the fingers wrap around the grip (Zone One), the front- and backstraps (Zone Two), and the side panels (Zone Three). Zone One is the most aggressively textured. Zone Two is the next most heavily textured, and the third has a mild, light grain texture that extends from the side panels to the entire frame. This third surface also contributes to the integrated look of the frame and slide. 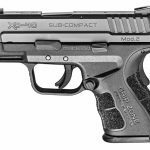 The Grip Zone design provides enhanced control, making the pistol less prone to torque, wrench or lever during recoil, and this is rather important for the .40 S&W and .45 ACP models. The Mod.2 triggerguard is also rounded at the front like the XD-S’, rather than squared off like earlier XD models, so there are no hard-edged surfaces in the Mod.2 design. In addition to being slightly narrower, the new Mod.2 slide has several external improvements, including new serrations at the rear called “Posi-Wedge Slide Serrations.” This deeply recessed design, with five deep grooves, helps reduce the chance for slippage when racking the slide. The red fiber-optic front sight helps to get on target faster under varying lighting conditions and, in combination with the combat-style, white-dot rear sight, the sight radius is extended by 0.5 inches on the Mod.2. Rounding out the “fit” of the XD Mod.2 are the grip angle and high-rise beavertail. 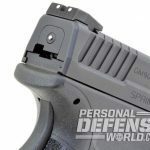 The guns also use Springfield’s established Ultra Safety Assurance (USA) trigger safety combined with a separate grip-activated safety. 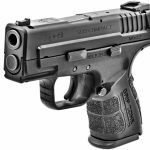 The end result is an XD with significantly improved sights, better handling, smoother exterior lines for carry and concealment, and a better grip while retaining the XD’s proven action and internals. The XD Mod.2 retains the XD’s easily operated slide release, takedown lever and ambidextrous magazine releases, the latter of which is placed at a slight angle and is now framed by a molded-in thumb rest. 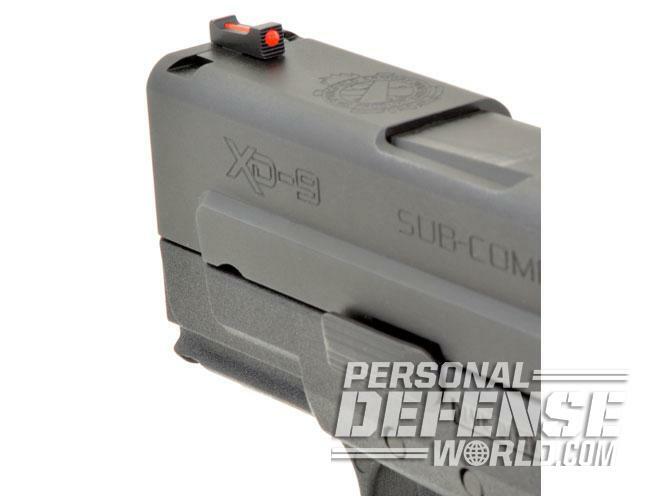 The proven XD design’s loaded-chamber indicator also remains one of the easiest to see and feel. 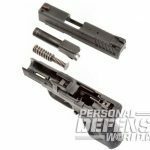 Located behind the ejector port on top of the slide, the front edge projects upward just enough that when a round is chambered you can either see it just under your line of sight or surreptitiously feel it by running a finger over the top of the slide. The Mod.2 also retains the original XD’s striker status indicator at the rear of the slide, which protrudes slightly from the back when the action has been cycled, thus it is possible to know the condition of this gun with two simple tactile or visual checks. 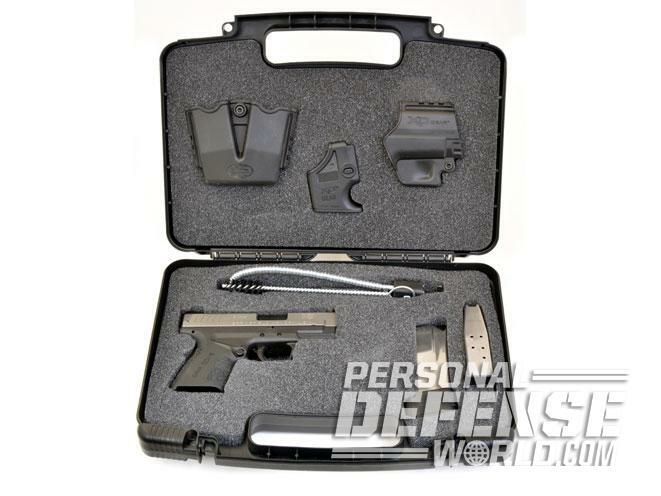 Being a striker-fired design, the XDs have no second-strike capability; however, they do have a very quick-reset trigger mechanism that requires the slide to be withdrawn a mere 0.25 inches to re-enable the action. 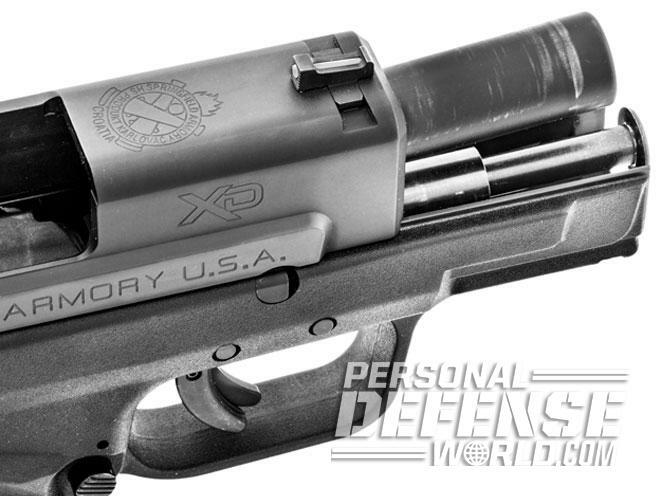 Internally, the XD Mod.2 models use the same proven Browning-type short-recoil system as all XD series semi-autos. The barrel design employs the later Browning solid camming lug, and locks to the slide with a squared face on the breechblock. A steel locking block, through which the disassembly lever passes, is pinned to the XD’s lightweight polymer frame. Finally, and very important with the .40 S&W and .45 ACP models, the recoil is tempered by Springfield’s dual recoil spring assembly, which has a large coil spring and secondary smaller coil spring within a captive, two-piece guide rod assembly. The Mod.2’s staggered, flush-fitting magazines hold 13 rounds in 9mm and nine rounds in .40 S&W and .45 ACP. 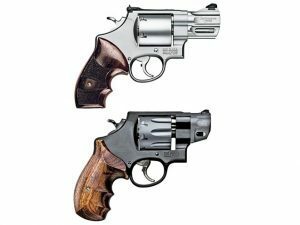 The guns also come with extended magazines bringing the total capacity to 16+1 in 9mm, 12+1 in .40 S&W and 13+1 in .45 ACP. 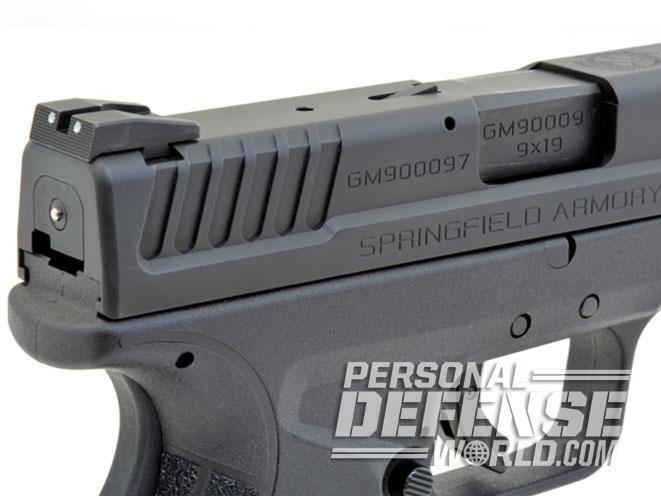 The longer magazines also extend the grip length with Springfield’s X-Tension cover, increasing the usable grip surface and overall height to 5.5 inches. 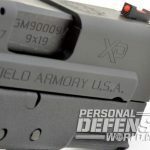 I was able to get my hands on the XD Mod.2 9mm, .40 S&W and .45 ACP pistols for testing, and the trigger pulls averaged between 5 and 6 pounds. 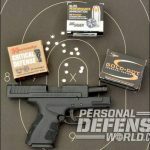 I ran the 9mm with Sig Sauer’s 124-grain Elite Performance V-Crown JHPs, Speer’s 115-grain Gold Dot hollow points (GDHPs) and Hornady’s 115-grain Critical Defense FTX ammo, firing at a Speedwell B-27 target 15 yards away. 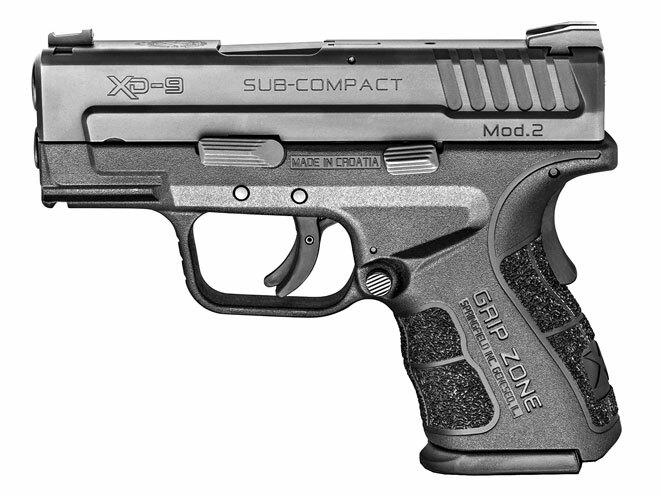 The 9mm XD Mod.2 balances well in the hand and stays put as intended with the Grip Zone texturing. 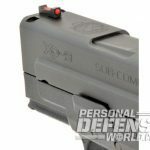 The recoil proved moderate, as is usual for the XD’s dual recoil spring design, and sight reacquisition was notably easier with the XD-S-style fiber-optic front sight. 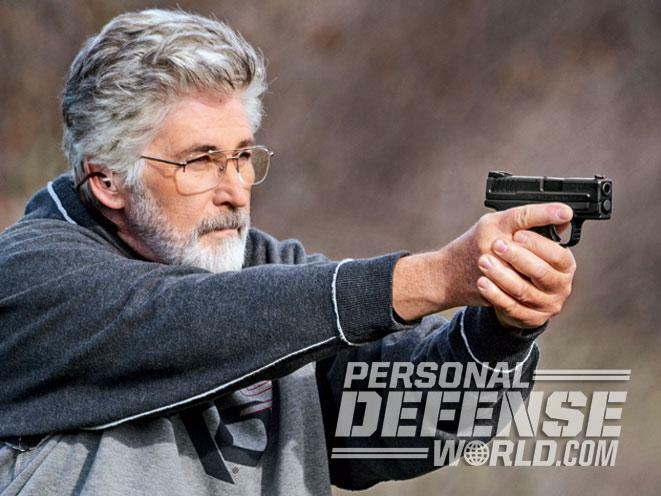 The best groups for all three 9mm loads ran from 1.27 to 1.7 inches—excellent accuracy for a pistol this size at 15 yards. There’s really no such thing as a light .40 S&W load. This is a cartridge with a kick that exceeds the 9mm and comes very close to a .45 ACP +P round. 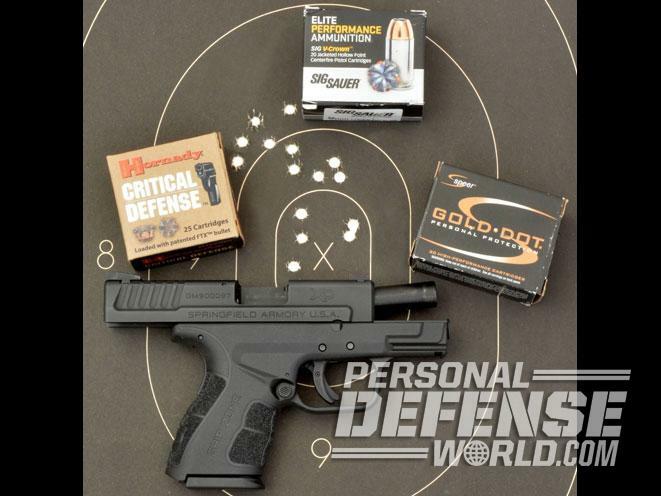 The slowest .40 S&W round tested, if you can call 1,070 fps slow, was Hornady’s 165-grain Critical Defense load, which, with the exception of one flyer, had a very tight grouping with four of five rounds under an inch with the fifth opening up the spread to 2.75 inches. In every other respect, the .40 handles exactly like the 9mm and .45 ACP Mod.2 versions. 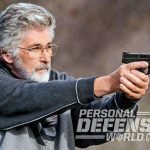 With the .45 ACP XD Mod.2, the best five-round group measured 1.5 inches with Speer’s 185-grain GDHP ammo, while the Federal Premium 230-grain Hydra-Shok HPs printed a slightly wider group measuring 1.85 inches with two overlapping. Hornady’s 185-grain FTX clustered five rounds into a group just a fraction tighter than 2 inches. 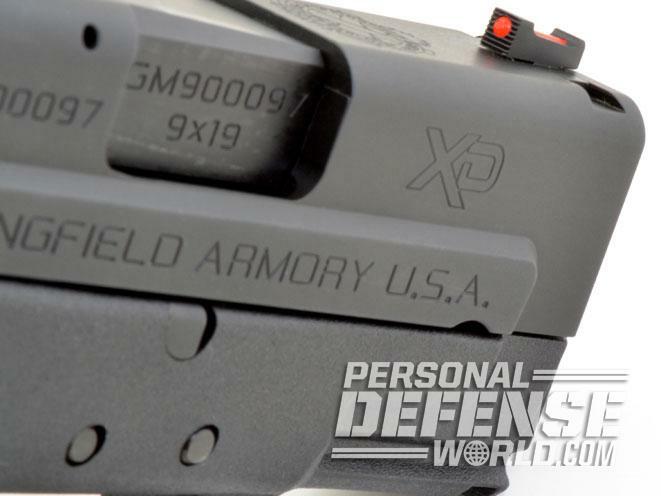 Overall, the XD Mod.2 pistols make great defensive carry guns with the latest features mixed with proven XD controls and internals, making these guns some of the best available from Springfield Armory. For more, visit http://www.springfieldarmory.com or call 800-680-6866.